This post will cover the May Day / Beltane ritual and celebration held by Circle of Fountains. To see the Circle of Fountains 2017 May Day ritual, click here! 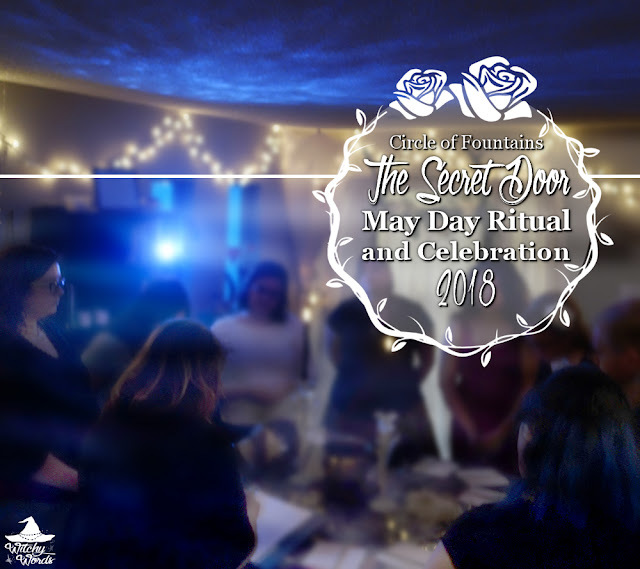 I wrote and led this year's May Day ritual! I identify as a nontheistic hedgewitch, emphasizing spirit work and shadow work as dynamic aspects of my rituals. My sabbats typically focus on some sort of veil-crossing aspect that requires participants to face their inner demons and come to terms with the whole of who they are. Because each member of our coven has a different path, having individual members each lead one sabbat a year allows us to sample the wide spectrum of witchcraft, expanding our horizons and experiences. 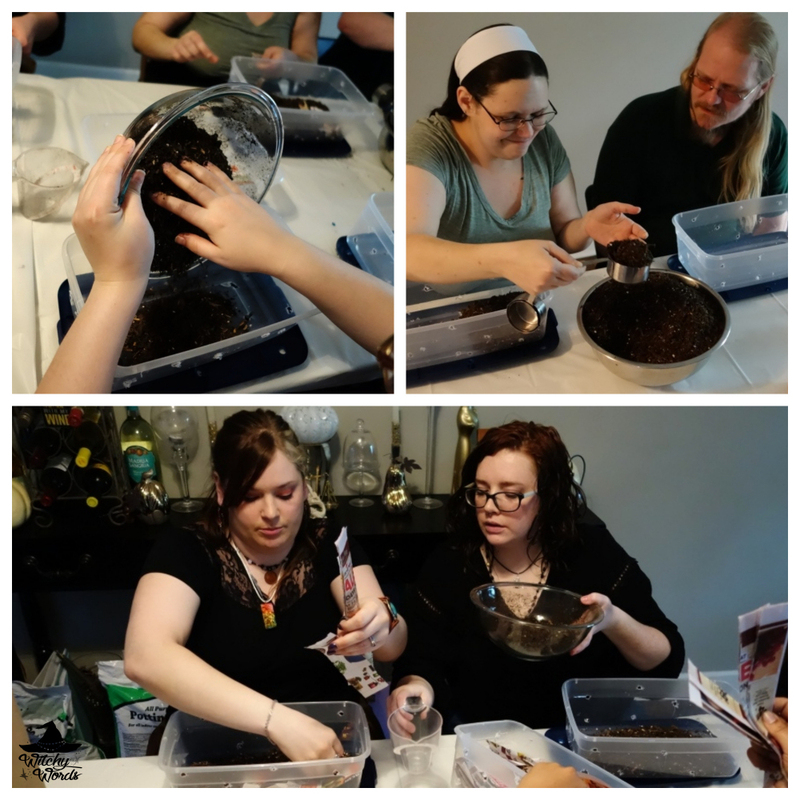 For this ritual, we began with our craft: Miniature compost bins! The process was simple. Each member received a small plastic tub pre-drilled with holes. They then layered it with dirt, shredded newspaper and dried leaves. At this point, I hadn't exactly told them just what they were making yet and instead waited until the end to pass out Composting 101 pamphlets. Creating something eco-friendly was essential to our upcoming ritual as the entities we were about to work with would require our commitment to aiding the environment. We then began serving our potluck dinner. As each member passed through to collect their plate and food, they also passed by a sigil made of flour along with a wine and bread offering next to a bowl of purified and charged water. I asked each member to rinse their hands in the purified water before serving themselves. However, we could not eat just yet. Based on an excerpt from the book The Resurrection in the Meadow by Robin Artisson, I recited my interpretation of the Faery Feast ritual. I first began by cutting a circle around the table using my athame. Lighting two candles, one white and one black, I also began burning a charcoal briquette for loose incense. The incense itself was a combination of rosemary, vervain and cinquefoil which I hand-ground myself using a mortar and pestle. Spreading blessed water on the table, I charged the area for the twins of the Seen and Unseen, then for the spirit-host and ancestors and finally for the good folk. I then burned a parchment to the court of the Faery people. Afterward, I sprinkled flour into the shape of a triangle, connecting the incense burner to the black and white candles. As I did so, I summoned the Faery king and queen. I blessed the wine in the name of the ancestral dead, the queen and king and the unseen and seen. I passed one cup of the wine in one direction while placing the other inside the triangle. I then blessed the bread in the name of truth, peace, life and the cunning of the art. I passed one loaf in the other direction for each person to take a piece and placed the second loaf within the triangle. Upon completion of our potluck dinner, we uncast the circle so that we could place the blessed and charged bread and wine outside for the Faery folk. Our offering had been made. It was now time for ritual. 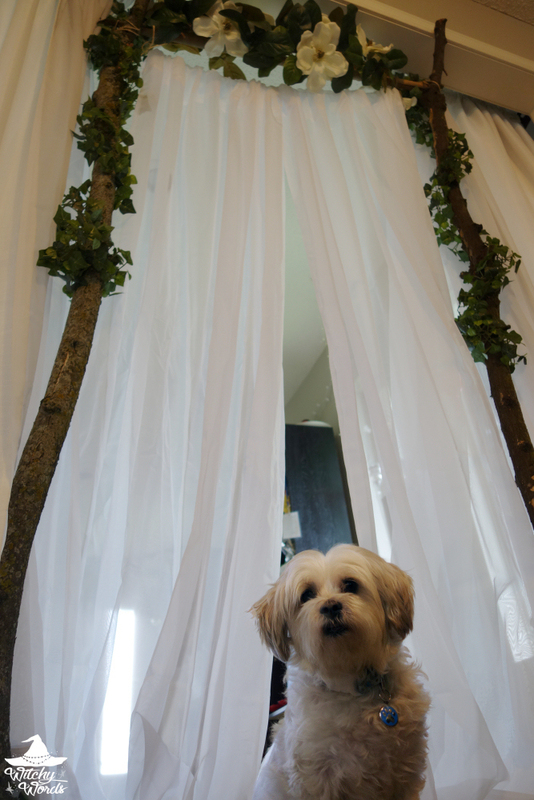 At the entrance of the ritual room, I created a Faery door from branches and vines. The door itself was tied together with twine and a veil separated the rest of the house, the mundane, from the room behind. As I sang The Secret Door, the circlemates entered the ritual room and formed a circle clockwise around the altar. The ritual altar was decorated for use, including various utensils I and the coven members would need throughout the ritual. On one side of the altar, fish bones and a coyote skull represented the Faery Queen. On the other, a full ram's skull represented the King. A black candle was lit in each of their favors. Above, blue waves swirled. Below, fog settled. Before ritual, I asked each of the circlemates to bring a specific offering for the Fae, from cream to honey, from homemade alcohol to decorated candles, from loose incense to flowers and from bread to jewelry. As I sang, each member contributed their offering at the secret door. My offering was my song. Admittedly, this was difficult for me. Though I was unaware at the time, I was at the height of pneumonia. I had lost my voice earlier that day and collapsed from lack of oxygen just prior to the evening. It was all I could do to softly squeak a head-voice enough to make the song work. That being said, I didn't feel I could swap it for the original version of the song. This was my offering and I had to make it, regardless of the pain evident on my face. After the song, we had an extended moment of silence to separate the mundane from the magical. We then began calling the quarters, beginning in the east and working clockwise. I wrote the following quarter calls for this ritual based on the four Faery cities and their inhabitants. Feel free to use them as you need: EAST To the vision of Gorias in the East, to the rolling grassy plane rippling in the pale dawn-light, to the triple stone circle and the sacred sword between, we travel your lush plains and listen to your winds whisper the secrets of what this land could have been between the stone pillars. We heed your call. ALL: OPEN THE GATES OF THE CITY OF GORIAS. We beckon the Sylphs to join us. ALL: HAIL AND WELCOME TO THE SYLPHS. SOUTH To the vision of Finias in the South, to the reddened dessert swirling around the oasis of white trees and aromatic flowers, to the eternal flame that burns about a sacred staff, we travel your multicolored stone walkways and feel the rays of the non-existent sun cast out the shadow in our heart. We heed your call. ALL: OPEN THE GATES OF THE CITY OF FINIAS. We beckon the Salamanders to join us. ALL: HAIL AND WELCOME TO THE SALAMANDERS. WEST To the vision of Murias in the West, to the sea between two hills that innately glows with the colors of a sunset and the quartz crystal shores, to the great cauldron of green stone from which the purest water flows, we travel your silver streams and drink from your sacred vessel the secrets of life. We heed your call. ALL: OPEN THE GATES OF THE CITY OF MURIAS. We beckon the Undines to join us. ALL: HAIL AND WELCOME TO THE UNDINES. NORTH To the vision of Falias in the North, to towering skyscrapers of aged stone emitting their own light in the darkness of midnight, to towering crystal of the living stone, we travel your urban maze and feel the resonance of the sacred stone imbue us with the tales of a land long lost and ancestors forgotten. We heed your call. ALL: OPEN THE GATES OF THE CITY OF FALIAS. We beckon Gnomes to join us. ALL: HAIL AND WELCOME TO THE GNOMES. At each corner, a representation of each city was placed. For east, it was a sword. For south, a staff. For west, a cauldron and for north, a large crystal. We then returned to the center and I made the final call, beckoning three entities: The Crossroads Keeper, Old Hobb, who brings the Great Washer; the Dark King of Elfhame who leads the Wild Hunt; and the Queen of Elfhame, Queen of Bones. With that, a low rumble set in and the ritual began. Hekate. Herne the Hunter. The Horned One. The Queen of Elphame. The leader of the Wild Hunt. When we think of Fae, we often picture the floral fairies from the Victorian era: Short skirts, sparkly wings and striped stockings on a small, feminine figures about 3” tall. In reality, most Fae look nothing of the sort. Instead, Faeries are the primal beat you hear when the lightning strikes in the dark sky, when the wind of a storm’s front catches you at the edge of a cliff, when the street light flickers in the dead of night. They exist in a realm that is neither here nor there yet somewhere between, a world between words, a plane within the veil. Their land reflects our land almost exactly as it is – only, it’s a world where humans never existed. And the beings from the Underworld? They are the shadows of human stature, the flicker of light just outside your vision and the non-human beast. They are both one and many, individual and hiveminded. They are gods, nature spirits, fallen angels, our long removed ancestors, elementals, ghosts and entities without names. They blur the line between what we understand about the Other, between the entities we know and the entities we think we know. And they have made their home in earth’s hallow places, the world soul and the primordial light and dark that is the rend of the worlds. Working with them is about achieving mutual goals, not self-help. They do not exist purely to enhance our lives. They are not there to grant our wishes – any relationship we forge with them must be wrought of faithfulness, honor and respect. You see, a person seeking a relationship with the Fae wouldn’t be interested in escaping the cycle of life and death, of darkness and light, of happiness and sadness. We cannot have good, or light, all the time. For the sake of our own souls, we must take the road of ashes, descent and grief from time to time. The witch that wants to forge a Faery path is determined to seek balance. Iron is the metal of the industrial age and the beginning of the plague upon nature. It is an affront to everything the Faeries stand for and thus, to honor them, all iron must be removed from the work space. Never thank the Faeries. In fact, thanking them can undo everything that you have created with your Faery ally and close their world to you. The statement “thank you” has no meaning to them. They have been thanked and burned one too many times. For the Fae, it’s about our actions, not our words. Instead, show your gratitude in two ways: One is respect for the land you walk on. This is why we created composting tubs for our craft. It promises that we will at least do something that helps this world moving forward. The second? Continued teamwork. Continue working with the Faery companions. Do not simply leave them behind. And the last, and perhaps most important, rule for working with Faeries: DO NOT LIE. The Fae can see all. If you approach them with a shadow on your heart, they will surely tear you to pieces. Only if your heart is pure can you enter their realm. And thus began the first part of the ritual: Disclosing all the secrets, all the lies, all the possible shadows on our hearts. I asked each circlemate to write all of them down on a piece of paper and, along with a poem read aloud, each of them burned them as an offering to the Fae. No one stated their secrets to the group. This was not for the circle to hear but rather to clear the air with the Faeries. Then the music changed again. And with that change, a presence entered the space. As the participants removed their lies, their secrets, their shadow, their dirty souls must be cleansed and so she came: The Great Washer, the eternal deprogrammer who meets us at our physical death. She is bat-winged, lynx-talloned, and black as a scald crow in her tattered dark robe. She approaches from the ford soaked in blood, wading through the body parts and burst veins of those who did not remove their shadows. She is here to wash the soul clean, preparing it for the rebirth of initiation. Are you certain you are ready? Behold, GREAT WASHER, a witch doth appear to bid the Faery realm welcome. You claim to the GREAT WASHER that you have removed the shadow upon your heart, that you approach the realm pure of intent without secrets, lies or falsehoods. How do you plead? Is your heart pure? If the circlemate answered yes, and they all did of course, then I cleansed their arms with the blessed water. If they told the truth, the water would have a cooling sensation. If not, the water would burn. For no one did it burn. Finally, it was time to make the journey to the Underworld and begin the initiation. I loathe the title of this but the beat was exactly what I needed. After explaining the paradox of the Underworld - that it is both a place of light and dark, that time works differently and that we enter into a distinct awareness upon entering their land - I began a meditation I found in Faery Craft by Emily Carding. I had everyone sit or lay in a way that they could see the secret door. I then rang a bell and guided them out of their body, through the door and down an ancient spiral staircase. At the bottom, they found a cavern with various tunnels and doors labeled with words or symbols. What are they? At the center, a shadowy figure turns a mirror on them. What do they see? Slowly, the shadow manifests into a specific figure. Who or what is it? Finally, that figure summons a crowd of shadows where one single figure stands out. That would be their guide. Their guide hands them a stone but they cannot make out the symbol on it before having to return to up the stairs and back through the door. Upon their return, each member was asked to pick up a stone from beside the secret door. Turning it over, they would see a symbol on it that would correspond with a message their guide was attempting to give them. Symbols on the stones ranged from skulls to plant leaves to paw prints and sigils. 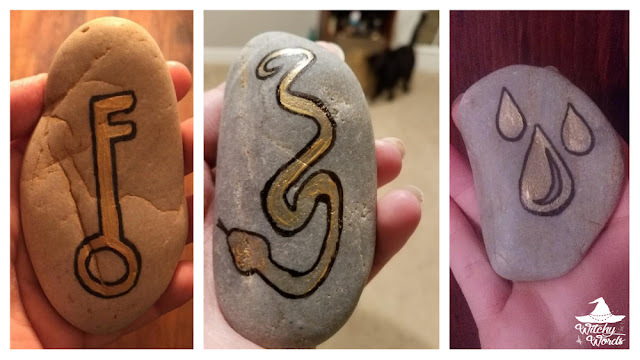 It was up to each member to interpret their own stone. From here, the journey with the Fae begins. Venture through that secret door, down those spiral stairs again and explore the many doors and tunnels from the inner hallow of the world, including the four Faery cities. The Fae have been forced to know our world. Now get to know theirs – you have been invited. With that, we closed the gates and bid the Fae farewell, however temporary. This is so, as Providence has woven thus; This is so, by th’ Earth and Heaven Your charge is clear; bring it to pass. Doing an intensive Faery ritual with pneumonia unmedicated is no small feat. My sacrifice, however, was met with a summon in the aftermath. The three remaining stones were my guide and they told me that I have work to do, places to go and an entity who desires my initiation. I am ready. Circle of Fountains hopes you had a glorious Beltane! What a wonderful ritual! I love the cleansing you did before hand involving the Great Washer followed by the descent into the Otherworld. I can feel the magic flowing out of this post. I got goose bumps reading the end of it. Thank you so much, Willow! I appreciate it! Thank you so much! Don't put too much pressure on yourself (says the pot, lol). Everyone's ritual style is unique. That's what makes our personalized rituals worthwhile! Amazing article and great ritual. The pictures were lovely and magic involved was wonderful. Thank you for sharing your story and inspiring everyone who reads one of your ritual posts. Thank you so much, Mrs. K! I appreciate it!